Following my last post about administration and monitoring tasks in VMware 5, I will talk about another promising feature of VMware vSphere 5.x: supporting NetFlow. NetFlow is a network protocol developed by Cisco for collecting IP traffic information. NetFlow has become an industry standard for traffic monitoring. As I wrote earlier, cloud/network engineers would like to have the same capabilities in virtualization as they have in physical networks and nowadays NetFlow is turning out to be the new trend in producing networking devices such as switches. In the same way switches support NetFlow, VMware implemented NetFlow that can be enabled on vSwitches, specifically very useful in Distributed switches. 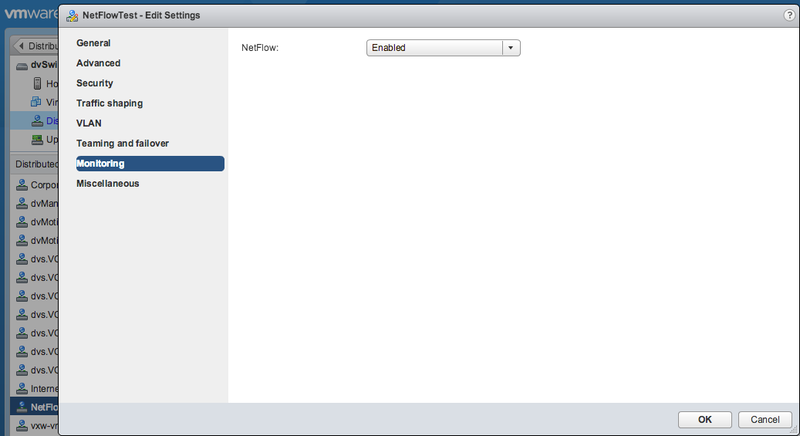 Good to mention that from version 5.1 VMware also supports newer version of NetFlow which is IPFIX. You can find more information about NetFlow by itself on the internet. Configure NetFlow properties on the dvSwitch. – Port is a UDP port which NetFlow collector will listen on. In NFDUMP, it is 23456! by default. – Of course, IP session between dvSwitch and NetFlow collector should be established in a proper way. I mean dvSwitch should see NetFlow collector. Enable NetFlow on the specific dvPort group. That’s it. In the next post, I will show how you can use a free, simple NetFlow Analyzer (nfdump, nfsen) to gather and display information about IP traffic flows in your dvSwitch.